The Echo’s Wish campaign starts today, with tokens being printed every day for the next eight weeks, until April 9th. Mersey Bowmen has been accepted into the pot… Now all we need to do is start collecting tokens. So please ask your friends, family and colleagues to start stockpiling tokens for you. There’s £50,000 up for grabs, which is allocated depending on the number of tokens we collect – the more we get, the bigger our share of the pie. We’ve got eight weeks to collect as many tokens as possible, with the cash we raise going towards work on the clubhouse, so we can increase Ritchie’s coaching programme. In the meantime, if we can rally as many people as possible to start collecting tokens for us, and hang on to them for now – Meryl Kelbrick is collecting them for the MB, so we’ll also update you and tell you about the best way of getting them to her. Or you can just follow the instructions in the Echo.Thanks folks! 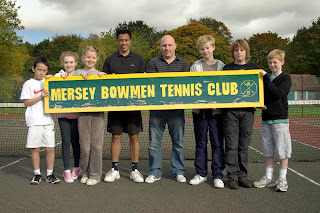 This entry was posted in fundraising, Liverpool Echo, tennis. Bookmark the permalink.